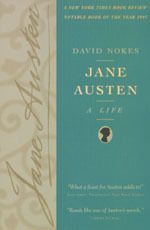 In this new biography of Jane Austen, David Nokes plays master sleuth and storyteller in presenting the great novelist "not in the modest pose which her family determined for her, but rather, as she most frequently presented herself, as rebellious, satirical, and wild." David Nokes is a Reader in English Literature at King's College, London. He is the author of John Gay: A Profession of Friendship (1995), and Jonathan Swift: A Hypocrite Reversed (1985).